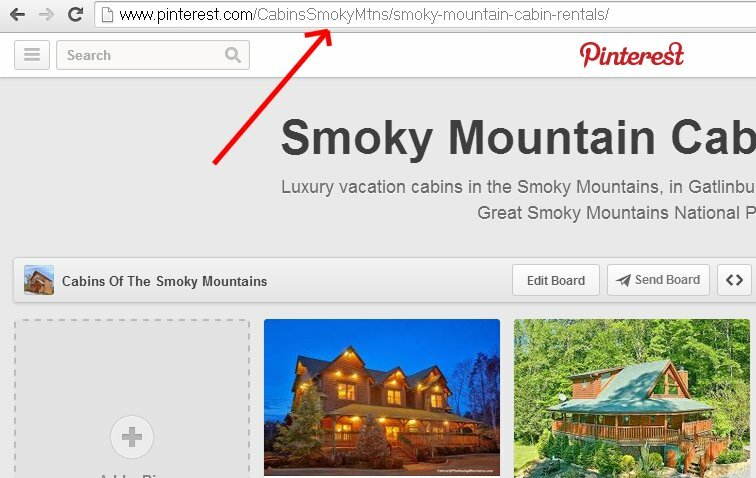 If you’re entering our Pin-It-To-Win-It Sweepstakes and you’ve made your new “My Dream Smoky Mountain Cabin” Pinterest board – here’s how to get the link to your board so you can email it to us. 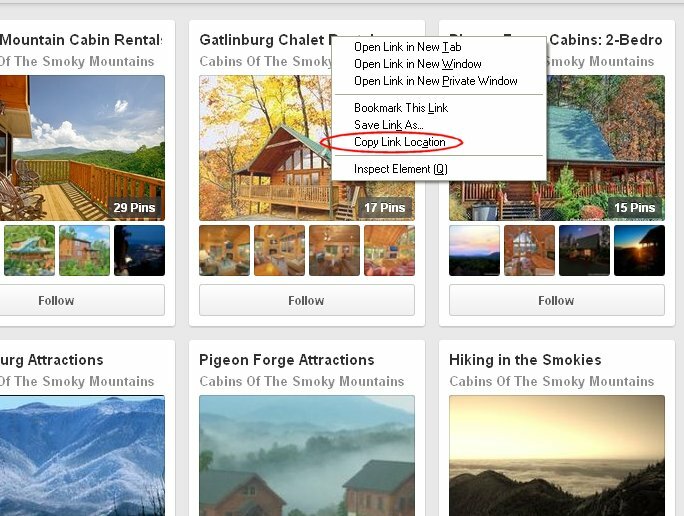 In Pinterest, instead of clicking on your board to open it up, simply RIGHT-Click on it with your mouse and one of the options in the menu says something like “Copy link location” or “address” – select that and the link is copied to the clipboard, ready for you to paste into an email. Then just send an email to [email protected] and you’re done. Alternately, go ahead and click on the board to open it up and notice the Web address at the top of your browser. Drag your cursor along that line of text to highlight it and then copy it (by right-clicking and selecting “copy” or simply by pressing two keys on your keyboard together, the Control and C keys. Either way the text is now copied to your clipboard, ready to paste). There is a 3rd way, you could use the Send Board feature in Pinterest and enter the email there – BUT this won’t give us your email. If you win we MUST have your email to contact you – so type your email in the Message section if you do this. Ideally send us the link directly in your email program if you can. In the final resort, if you still can’t get the link just send us the email with a message saying that. If you win, we’ll contact you and figure out where the board is. Don’t worry, if you win, we won’t let you lose!